Today’s tournament featured a topsy-turvy top quad. 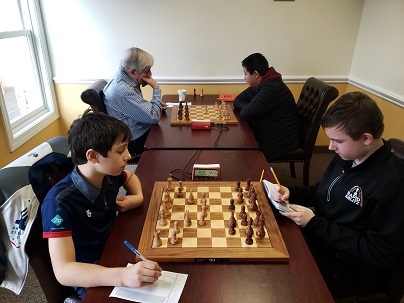 By the end of round two, NM Rey Magallanes held a full point lead over NM Oliver Chernin (who so far had two draws) and looked to be in a comfortable position to win the section. However, Chernin managed to defeat Magallanes in their final round encounter. The two masters tied for first with 2/3 each. Cayden Yang had a similar full point lead going into the final round of quad two. 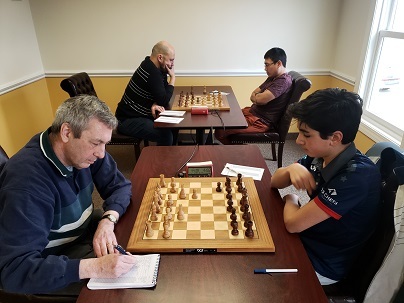 A draw with the top seeded Frank Prestia guaranteed him clear first place with 2.5/3. 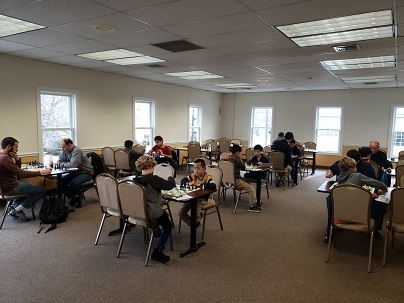 Jose Leon duplicated Cayden Yang’s result in quad three to take clear first place, while Justin Paul also scored 2.5/3 to win quad four. Emmanuel Hernandez scored the first perfect score of the day, winning quad five by a full 1.5 point margin! Finally, Max Meister won quad six with an impressive 3/3 perfect score!